In the digital age, many young people have no memory or understanding of the role of negatives in photography, much less glass negatives. So a word of advice: should you find boxes of glass plates with negative images on them, save them. You might have discovered a treasure trove. That is what happened in about 1980 to graphic designer David Stahl when he and his wife bought the run-down house next to the home they were restoring at 1939 N. Pennsylvania Street in Herron-Morton Place neighborhood. The house at 1945 N. Pennsylvania Street, divided into eight apartment apartments, was now home to transients who came and went. 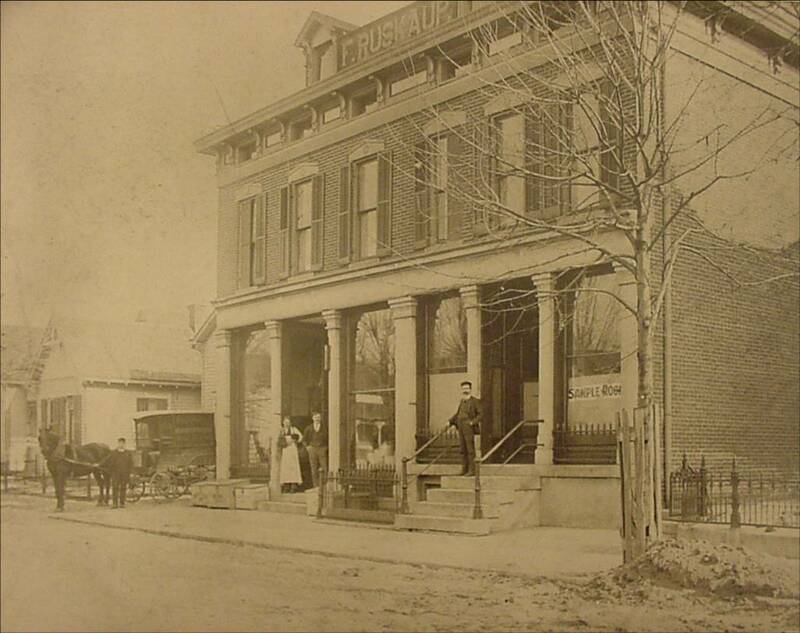 Like many urban pioneers, the Stahls purchased the derelict house to improve their block. Three or four years later David finally explored the attic where he discovered wooden crates filled with Kodak boxes. Inside were nearly 400 glass plate negatives in old manilla envelopes, many hand labeled with names such as Lilly, Riley, Nicholson, Bobbs, Woollen, and Taylor. Most of the images were soft-focus portraits of women and children, dusty but remarkably well preserved, considering the poor storage environment found in attics. Stahl was most interested in this outdoor view of an Abraham Lincoln doppelgänger wearing a top hat. While the man was interesting, it was the porch in the background that got Stahl’s attention. Like many 1890s Victorian houses, their front porch had been replaced with much-later brick, concrete, and limestone, so they had no idea about the original design. 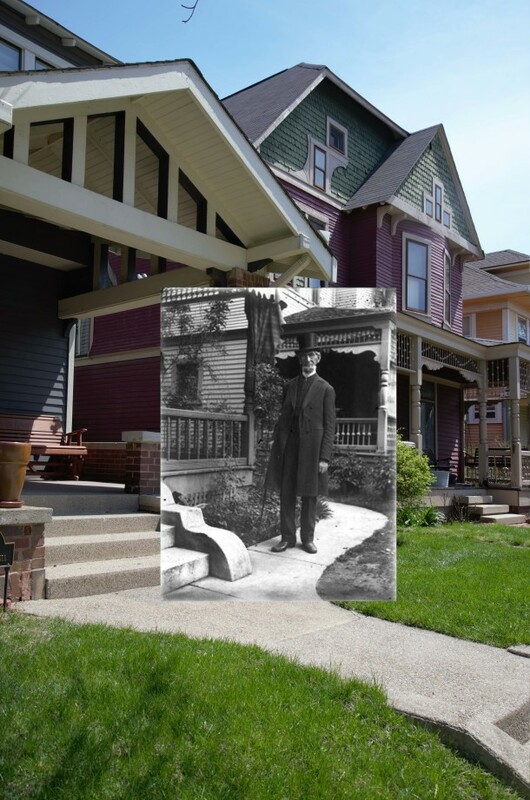 Almost by accident, decades earlier the unknown photographer had documented the Stahl’s porch when he or she photographed this distinguished gentleman standing in the front yard next door. With a print showing the turned posts, decorative brackets, and stick and ball fretwork, the Stahls received permission from the Indianapolis Historic Preservation Commission to rebuild their porch to match the original. Stahl, who had done design work for the Indiana Historical Society (IHS), arranged for the collection to go to the Society’s library in 1985. Flash forward a few years to 1992. The IHS had arranged and archivally rehoused the collection of 372, 6 1/2″ x 8 1/2″ dry plate glass negatives. Through a little research for an exhibit, the remarkable but brief photographic career of the photographer, named Mary Lyon Taylor, became known. Taylor’s 91-year-old son Heber was discovered in a San Diego nursing home and was shocked to learn that when his family left their old Pennsylvania Street home in 1921 his mother left her negatives behind, an action that he surmised must have been an oversight. Heber agreed to an oral history interview and helped tell the story of these artistic negatives that had been abandoned seven decades earlier. Mary Lyon Taylor (1872-1956) was raised in Ripon, Wisconsin, and Minneapolis, Minnesota, and had taken art classes at home and abroad, specializing in miniature portraits on ivory and porcelain. 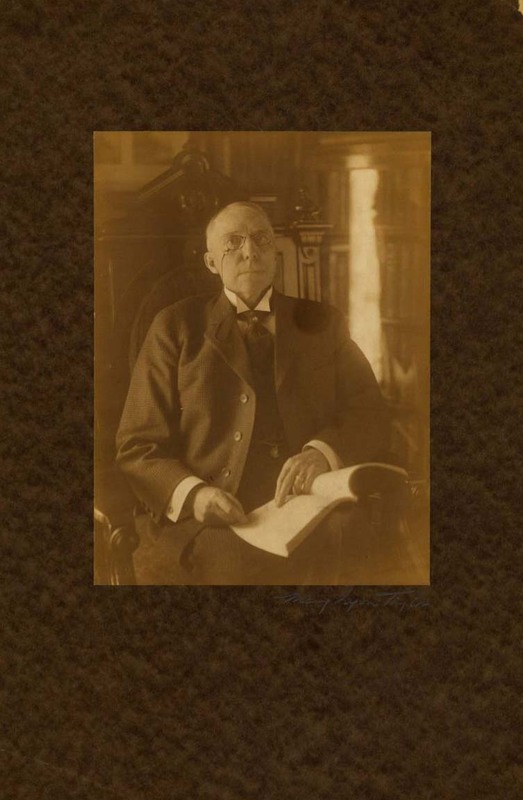 While visiting her sister, the wife of Rector Andrew J. Graham of Christ Church Cathedral in Indianapolis, she met Edward Taylor whom she married in 1898. The Taylors bought the house at 1945 N. Pennsylvania Street and had two sons, Edward Lord Taylor and Heber Newton Lyon Taylor. Heber recalled that his mother took up photography when she acquired a snapshot camera in about 1899. 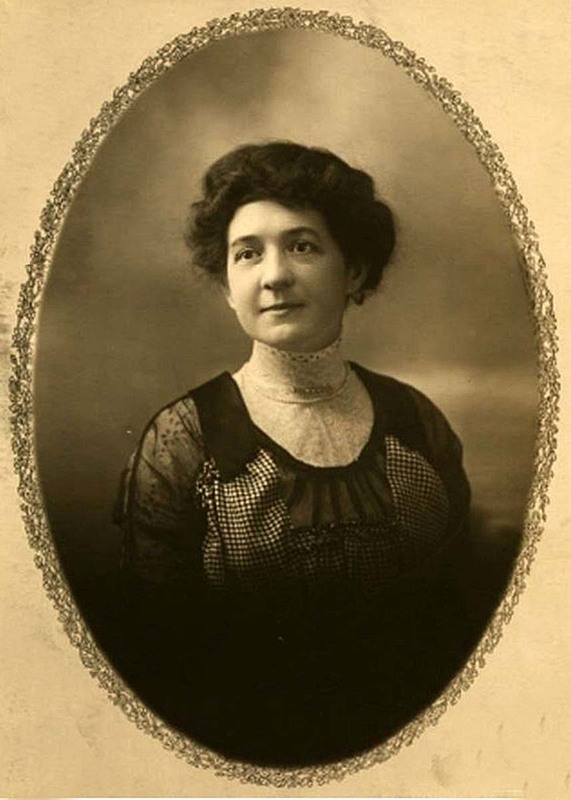 Her husband’s family owned Taylor Belting Company in the Wholesale District and the Taylors seemingly lived a prosperous life with live-in maids and nannies in an affluent neighborhood. Yet financial difficulty led Taylor to ease the burden by starting a home portraiture business in 1906. Photography was a socially acceptable profession for women, who were recognized for their artistic compositions and ability to bring out the inner character of sitters. We know little about how she learned photography, but John Chislett, the city’s leading pictorial photographer, owned nearby property and the Herron Art Institute, just two blocks south of her home, had a camera club. Taylor began by photographing her family and friends in her drawing room and eventually traveled to photograph the sitters (mainly neighbors, church members, and her mother-in-law’s club friends) in their own homes, charging $100-200 per order. Taylor’s career slowed in about 1908 when she separated from her husband and moved her two sons to Minneapolis to be with her family. After about a year the couple reunited and Taylor returned to Indianapolis. Negatives of the Pillsbury family of Minneapolis suggest that she may have continued photography during their separation when she needed the income. Taylor worked a few more years, exhibiting photographs in the thirteenth Annual Exhibition of the Richmond (Indiana) Art Association (1909) and the fifth and sixth American Photographic Salons (1908 and 1909), national traveling exhibitions that included showings at the John Herron Art Institute. Taylor copyrighted several of her earlier images in 1909 and 1910. In 1911 she won first prize in the Kodak Advertising Competition for her portrait of Ruth Clifford Hodges. Throughout her life, Taylor also expressed her artistic side through other mediums. She served as president of the Indianapolis Women’s Needlework Guild, wrote poetry, and published more than twenty pieces of sheet music. After an unsuccessful attempt at operating a dairy farm at Fall Creek Road and Orchard Hill Lane, Taylor’s family moved to California, first living in La Jolla, and later in Beverly Hills. 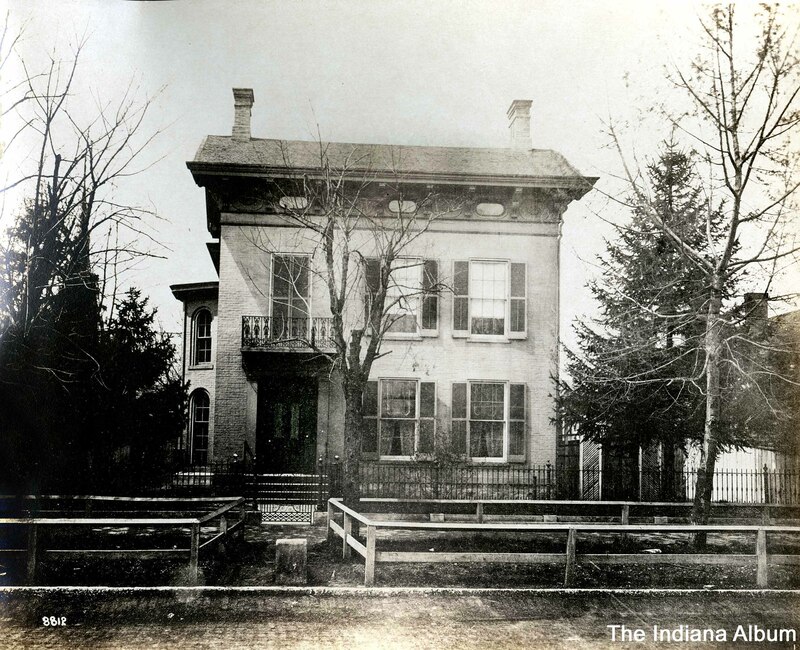 After her husband’s death in 1934 and her oldest son’s suicide in 1950, Mary Lyon Taylor returned to Indianapolis where she died on January 5, 1956. Her son Heber, the last member of the family, never married and returned to San Diego. At the time of his oral history interview, nursing home staff said that he had never had a visitor in the twenty years that he had lived there, so he was overjoyed to share her story and donated other photographs and family papers. Heber died three years later and is buried in Crown Hill Cemetery near his mother. 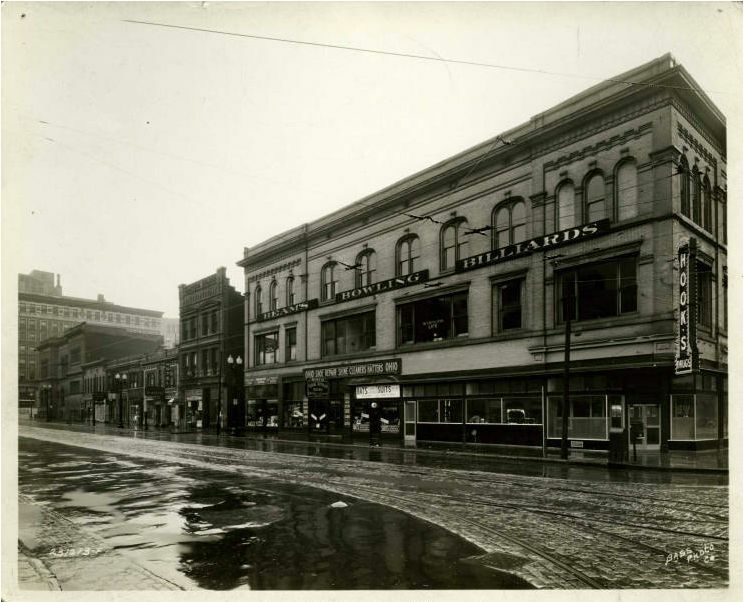 Today, both 1939 and 1945 N. Pennsylvania Street have been restored. 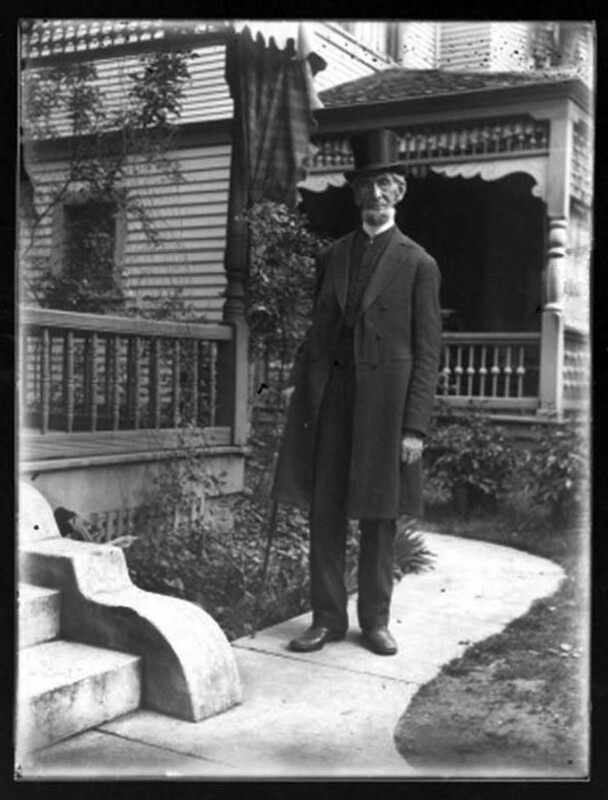 The older gentleman in the top hat was Taylor’s 87-year-old father, Daniel Brayton Lyon (1820-1912). Newspaper clippings in the collection reveal that he was aware of, and probably played up, his resemblance to Abraham Lincoln. Once when he visited the United States Capitol, women fainted upon thinking that they had seen the ghost of the former president. What’s hiding in your attic? 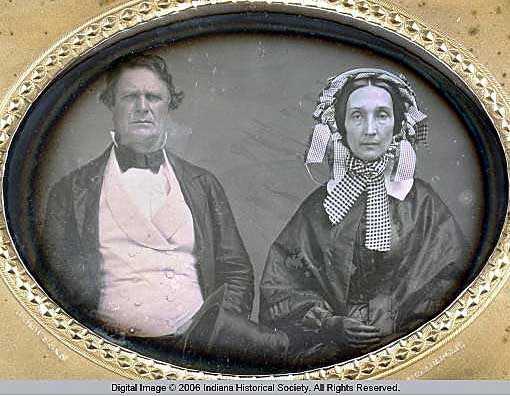 If you have glass negatives or other Indiana photographs that you are willing to loan to the Indiana Album, a state-wide Indiana Bicentennial project, contact info@indianaalbum.com. We will scan your images while you wait or provide instructions for scanning them yourself. Interviews with Heber L. Taylor, August and September 1992, San Diego, CA, conducted by Joan E. Hostetler. “Artistic Photos by an Indianapolis Woman,” The Indianapolis News, 2 November 1907, 22. “Mary Lyon Taylor’s Latest Song will be Heard Today,” The Indianapolis Sunday Star, 12 May 1929. “Photographic Studies of Home Life: How One Woman has Developed a Pastime into Work that Possesses Great Individuality and Charm,” Craftsman, v. 13, October 1907-March 1908, 150-57. “Woman Farmer, With Aid of Son, Merges Artistry and Practicality at Beauty View,” The Indianapolis News, 17 June 1922. Hostetler, Joan E. “The Pictorialism of Mary Lyon Taylor,” Traces of Indiana and Midwestern History, Winter 1994, 36-39. Taylor, Mary Lyon. “Open Spaces,” unpublished manuscript in Mary Lyon Taylor Collection (P281), Indiana Historical Society. Taylor, Mary Lyon. “The Person Who Has Influenced Me Most,” unpublished manuscript in Mary Lyon Taylor Collection (P281), Indiana Historical Society. Joan, Thank you for such a wonderful piece of Indianapolis history. The photographs are incredible – she was extremely talented. Wonderful research and a joy to read! Thank you, thank you!! Great article, Joan! Stories like this really make the city’s past come to life. Great article! I didn’t know about these negatives and the incredible story behind them. Always great photo stories, Joan, but this one takes the cake! So close… we own 2001-03 N. Pennsylvania and I came across the Taylor photos on the IHS web site searching for pictures of our property, but have never located any. Thanks for the article. I believe Edward Taylor was my grandfather’s, Harold Alexander Taylor’s, brother and I am interested in gathering information on my Indianapolis Taylor side of the family.Are any of the Mary Lyon’s Taylor photographs of the Taylor family available for public viewing and if so, where – I would also like to get copies of the Heber L. Taylor interviews and family memorabilia. I have some older family photos of my great grandfather with his wife and children taken before my grandfather was born if that information is of interest. To me it is sad that neither Heber nor my late uncle Noel Taylor [cousins – one of Harold’s sons] didn’t know that they were close to each other with my uncle being a Hollywood costume designer and living in West Hollywood at the time that Heber was in San Diago.